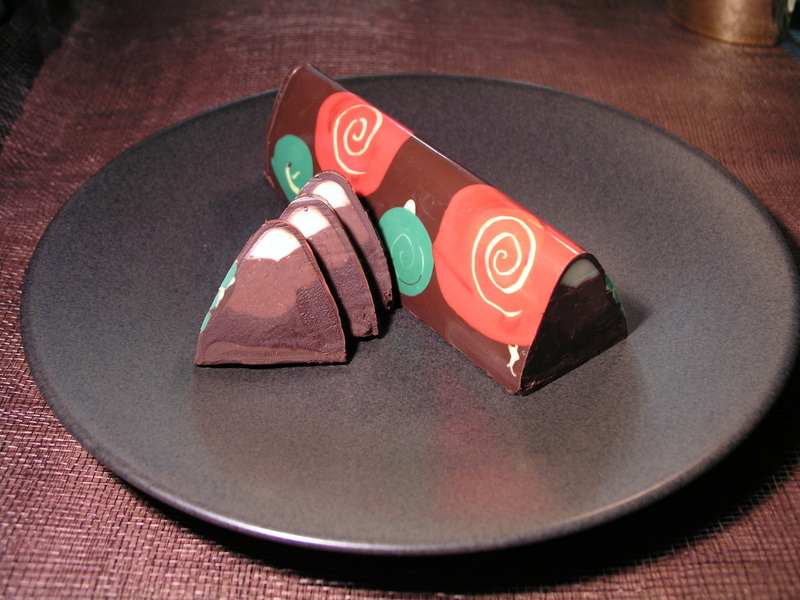 Sterling Truffle Bars blend the best white, milk and dark chocolates, fruits, nuts, and flavors with culinary artistry. 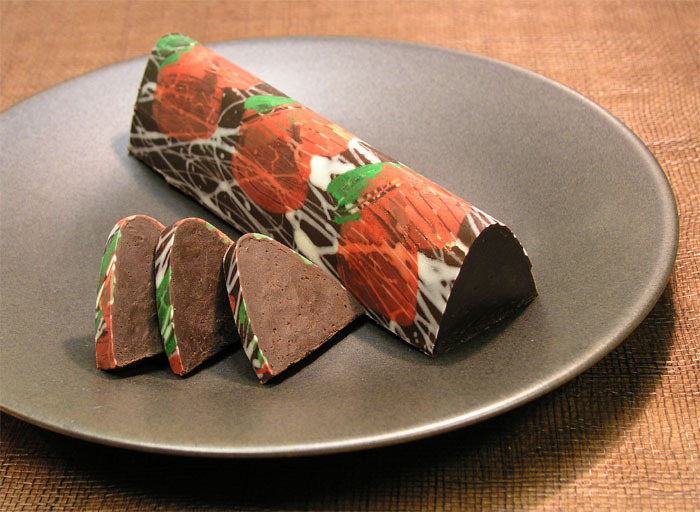 Each decadent truffle bar flavor has an extraordinarily colorful hand-painted chocolate design. 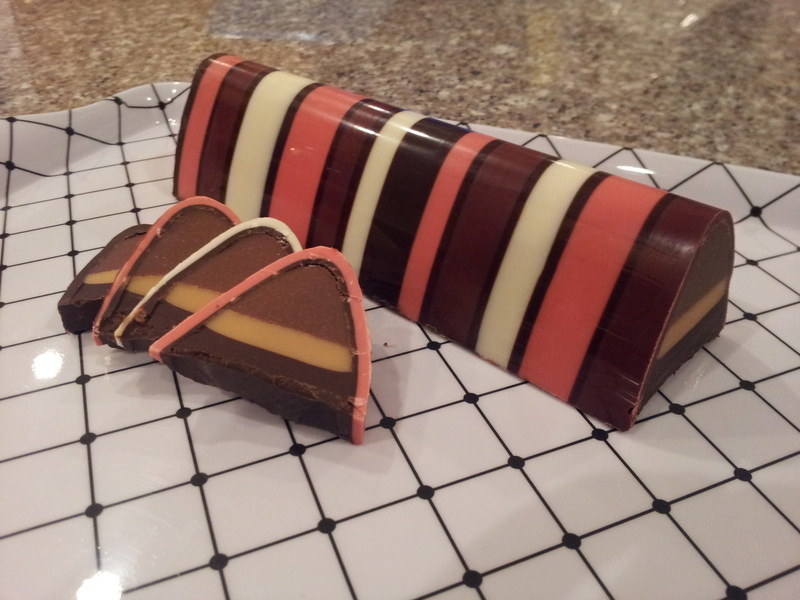 The triangular bars are to be served sliced, exposing beautiful layers of ganache. They are perfect for any gift giving occasion. All orders ship to the continental US for a flat rate of $11.99! (Please note, we will insulate and ice pack all summer shipments but to insure safe delivery we only ship Monday thru Wednesday each week to valid USPS addresses. This insures packages will be delivered during the week and not sit in a hot mail room somewhere for an extra two days. IT IS STILL CRITICAL THAT YOU KEEP AN EYE OUT FOR YOUR PACKAGE! NO AMOUNT OF ICE WILL PROTECT THE CHOCOLATE IF IT SITS IN THE SUN ALL AFTERNOON! All orders placed Wed-Sun will be shipped the following Monday). During the next few weeks I will be working on opening our new candy kitchen. In the meantime, things have been kind of chaotic and difficult to keep bars in stock. We are working furiously to get things settled down and appreciate your patience during this process. When the kitchen is complete we will be able to offer the full range of all our scrumptious confections and will also be introducing a few new flavors to our Sterling Truffle Bar line! Once production starts up again I will list the bars for sale as soon as they are ready. A striking, hand-painted truffle with contrasting tiers of milk chocolate flavored with rich hazelnut puree, white chocolate infused with caramel and dark chocolate with a hint of ground hazelnut. Not Available At This Time. Sold Out For the Holiday. More Being Made. Our same great Double Hazelnut bar dressed up for the holiday. Supplies are limited so order yours today! A striking, hand-painted truffle with contrasting tiers of milk chocolate flavored with rich hazelnut puree, white chocolate infused with caramel and dark chocolate with a hint of ground hazelnut. 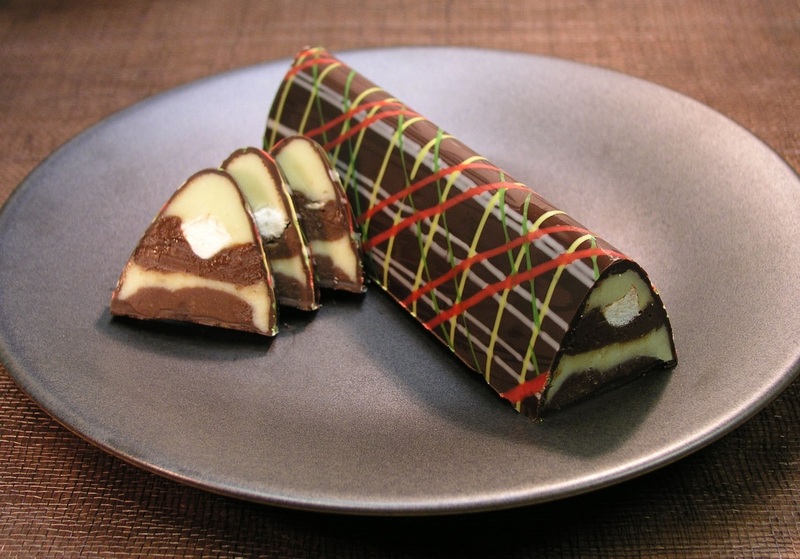 A distinctive abstract grid of green, yellow, red and white stripes enhanced with a filling of milk and white chocolate, toasted almonds, marshmallows and a hint of vanilla. A hand-painted truffle with contrasting tiers of milk chocolate flavored with banana, white chocolate infused with caramel and dark chocolate with a hint of fresh locally manufactured honey. 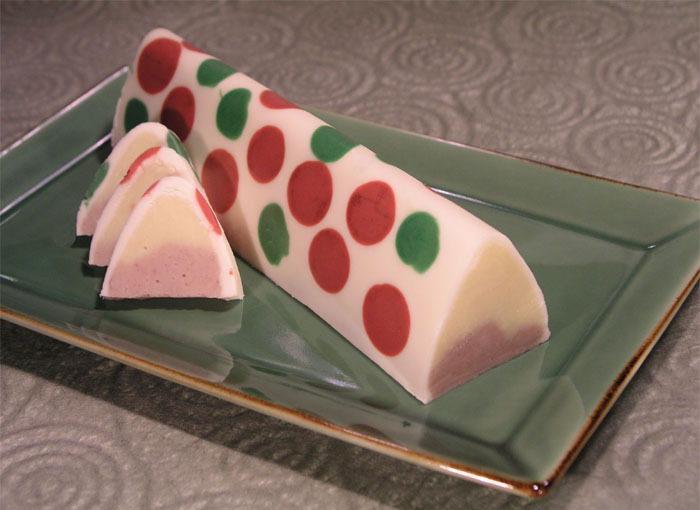 A pink and green polka dot design enhanced with fillings of white chocolate and raspberry ganache. The taste culminates with a mild mint essence. 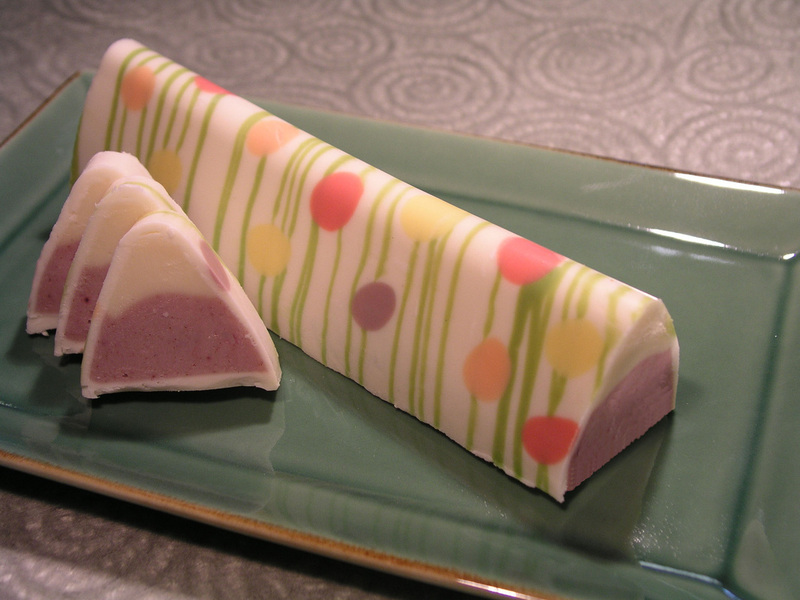 This is our same White Chocolate Raspberry coated in bright colors for Spring/Easter time. A pink and green polka dot design enhanced with fillings of white chocolate and raspberry ganache. The taste culminates with a mild mint essence. 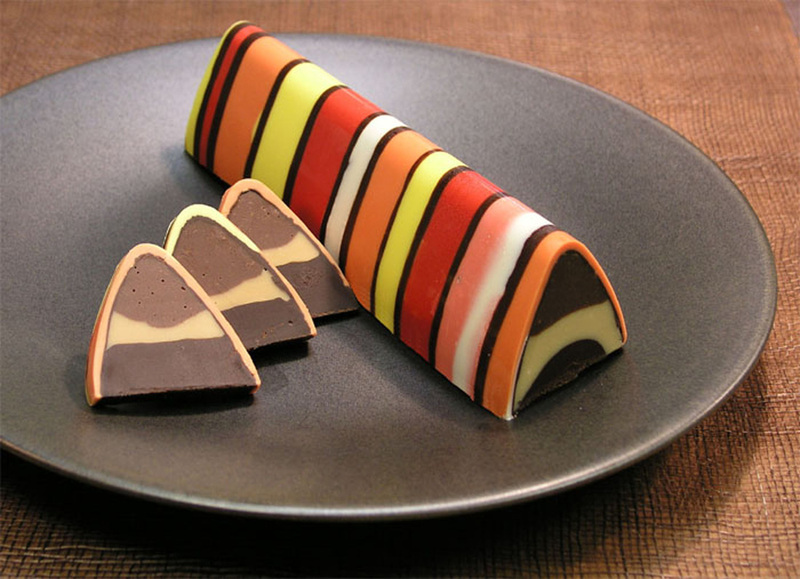 A vividly hand-painted truffle filled with dark French vanilla ganache enhanced with the flavors of strawberry and aromatic orange. 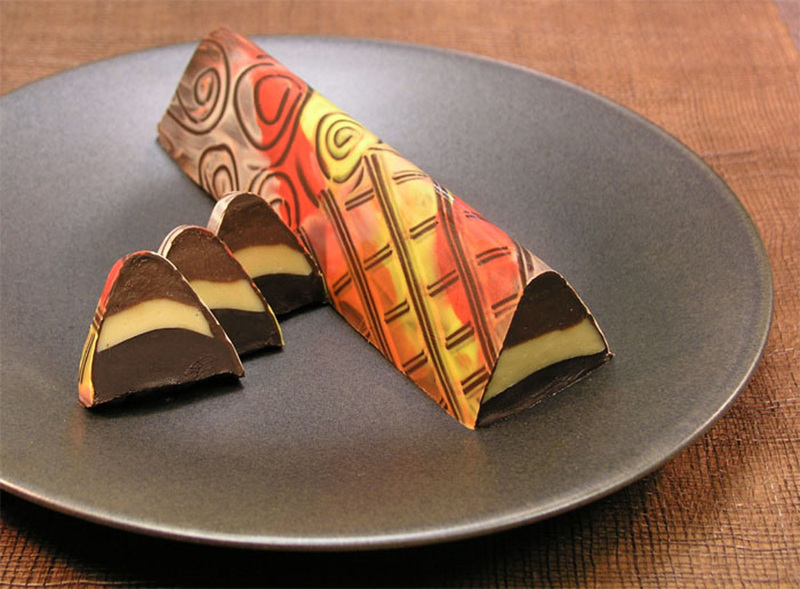 Contrasting flavors of dark chocolate with a crunch of macadamia nut praline, white chocolate with candied ginger and pineapple all encased in a hand-painted study of abstract strokes. An artfully hand-painted truffle filled with the mingling flavors of milk chocolate, coffee-infused* white chocolate, dark chocolate, coffee liqueur and a subtle finish of lemon. *We use only locally roasted artisan beans from Caffe Ibis Roasting Company. They are organic, fair trade and Smithsonian Shade certified. Our same cappuccino bar dressed up for the holidays. 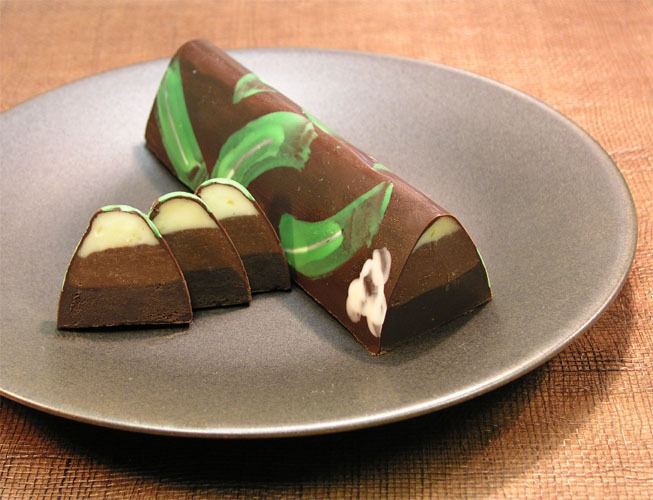 This hand-painted truffle is filled with the mingling flavors of milk chocolate, coffee-infused* white chocolate, dark chocolate, coffee liqueur and a subtle finish of lemon.